This week's challenge over at Less Is More is Birds and it's a one layer week too. Funny how a while ago I found OLCs a challenge and now I like them a lot! 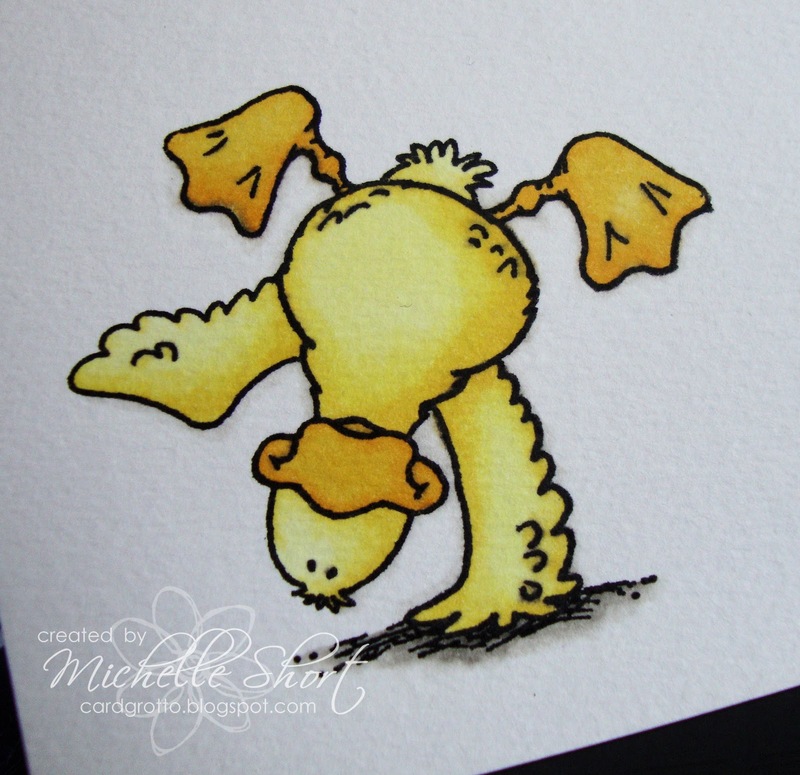 So for my card this week I have used the very cute High Hopes Wingin' It Duck and stamped him on to a white square card blank then coloured with Copic Markers. I have stamped the sentiment - from the Paper Smooches Sentiment Sampler Set at the top and then added three rhinestones underneath. STAMPS: High Hopes, Paper Smooches. INK: Memento Tuxedo Black. COPICS: Y11, Y13, Y15, Y17, W0, W2, W3, W4, Blender Pen. CS: Craftwork Cards. EMBELLISHMENTS: Papermania Sunshine Adhesive Stones. Thanks for visiting me today and all the lovely comemnts I recieved on my last card, they are most appreciated. I'll be back on Monday with another SNS card. Have a great weekend! Oh and can I just add, I am having some problems leaving comments at the moment, for some reason the pages don't seem to want to load for me whatever I try. Love your funny little birdie! 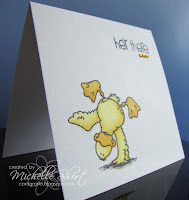 I LOVE this card Michelle.....so cute! 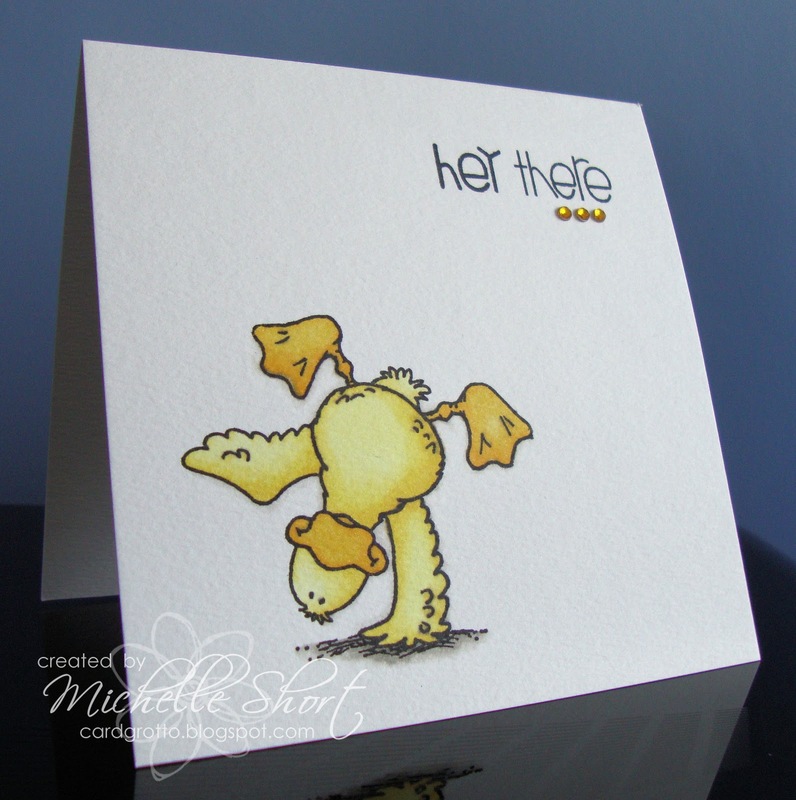 Scrummily cute card - great little cartwheeling duckie! He is so cute!! Love it Michelle! You card is adorable....ooops, I wish I had looked around first before making my card. We are sort of twins-I just threw in my sentiment and then saw yours. Sorry! Tooooooo cute!! LOVE your duckie and your coloring is wonderful:)!! I absolutely love this. Such a cute card! Awesome card! Love the cute image and the positioning is fab! I have this little guy too ... isn't he just THE best! It's a fabulous card... I'm so glad you like making OLCs now! what a great image, and so wonderfully colored! Oh this is so fabulously cute. Sweet card. I like this image. How cute is that! great image and colouring! Aaah! Your little cartwheeling duck is so cute Michelle! this is an adorable card! love the image - great coloring! What a great image, love it! I definitely need to check out the High Hopes stamps...they are so darn cute!! Fab card! A very nice card! I like the duck. And your version of this card is great!